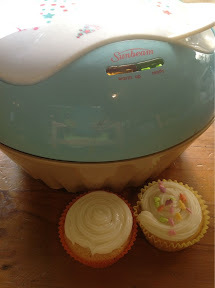 A whole ago I bought the Sunbeam Pattie cupcake maker, and I figured it would be a cute and easy way to bake with my niece. WRONG! It turns out that is is awesome for making just enough cupcakes for morning tea, so that they are always fresh! Except generally cupcake recipes are for more cupcakes. Pattie makes 6 at a time so easily, so I’ve been working on recipes to make just a half dozen cupcakes at a time. These are soft, fluffy and gorgeous. Beat the egg in a jug. This makes it easier to fill the cupcakes…. Add softened butter and sugar and beat. The mix should be light and soft. Add milk, flour, baking powder and vanilla. Combine with a spatula. Heat Pattie, placing the cupcake liners in the spaces. You can bake these at 180 degrees for about 15 minutes, but Pattie is only about 8 minutes. Pour the mixture into cupcake liners, leaving about a cm at the top of the liner. The cupcake should rise to the top of the liner. Bake for about 8 minutes in Pattie, or 15 in a conventional oven. Heat the butter and cream cheese in the microwave for about 20 seconds. Stir briskly, mixing into a paste. Add a few drops of strawberry essence. Stir. Add the icing sugar, stir until combined. Load into a piping bag and pipe onto the cupcakes. Decorate with sprinkles if desired. ← Muffin Tin Monday- Rawr Dinosaurs!